Table top thermal transfer pouch printing equipment for foil bags, film bag, Tyvek pouches, hanging cards, garment tags blister card, flat boxes, lids, labels, envelops, many other flat items; can print on items up to 12 inches wide. 300 DPI resolution. 17 different rotatable fonts. Will print 1 D and 2 D bar codes. Will print text graphics directly on pouches, flat products and foil laminate pouches. Bat code readers will inspect quality of the print on a Tyvek pouch. The machine uses a ‘center feed’ to move pouches from a magazine for greater reliability in feeding pouches. Also pouch rejection rollers increase reliability of the machine. This systems allows irregular shaped items to be feed. It then uses a high definition thermal transfer printer to print directly on the pouch. This eliminates the need to use a label to print information on the pouches. Optional bar code reader, and vision inspection system for 100% inspection. Printing directly on the Tyvek or foil pouch reduces labor costs for applying labels, and the cost of the label. 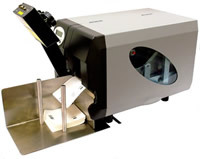 Automatic label applicators will apply pre-printed labels onto flat items like pouches and cards.